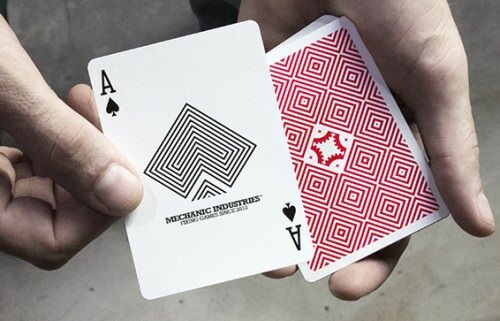 The Mechanics Optricks deck (Red Edition) is the latest deck from Mechanic Industries, and is brimming with innovation and illusion. I've written about the decks from Mechanic Industries before - see my review here for coverage of their original Mechanic deck, original Optricks deck, their accessories, and their video tutorials. 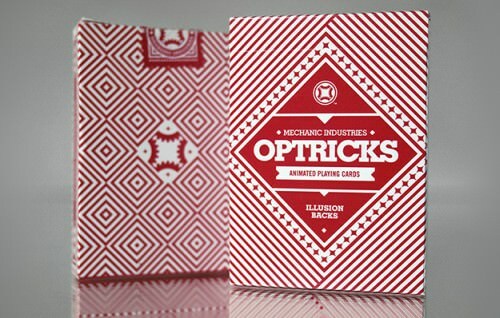 The previous Optricks deck was in black, while the second edition is in red, and takes all the animations and innovations of the original deck to the next level. The difference with the tuck box of this new edition is obvious: it's simply undergone a respray with the black being replaced by red. For the rest, the details are the same - why fix something if it ain't broken? But as we all know, fire engines are painted red because it's a faster colour, and there is something about the impact of this visually captivating image that grabs us from the get-go, especially in red. The subtitle of the deck gives us some indication of what we're in for when we take this bad boy for a joyride: "Animated Playing Cards" and "Illusion Backs". In other words, get ready for a real head spin, courtesy of some optical illusions! 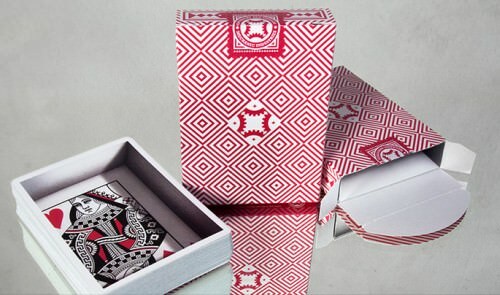 Don't say you weren't warned - one look at the back of the box will already give you an indication of the kind of hypnotic impact this deck can create, since it appears as an optical illusion. The card backs feature this same signature hypnotic design, which has been inherited from the original deck, and is composed of a series of squares. The more you look at the back design, the more different shapes and styles you see popping out at you. The cumulative impact of the red and white lines in a geometric style creates a hypnotising and mesmerising look that can start making you go giddy just by staring at it! But what is especially great about the back design is that when the deck is riffled, each card back flips from one to another, and due to slight differences from one card to the next, this creates a mesmerising and hypnotic illusion as the cards are flipped through. It appears as if the squares sink into each other and come to a point, and truly is a great piece of optical trickery. For this to work, however, the deck ideally does need to be in its original order. The flip animation doesn’t look quite as effective when the deck has been shuffled, but it still does look impressive! The Ace of Spades hasn't changed from the successful first edition, and is composed of black and white lines, that simultaneously does its job of communicating the Spade suit, as well as continuing the illusion effect. Besides the Ace of Spades, the cards have a relatively standard look - which is what we'd want in a deck that is also intended for card magic. 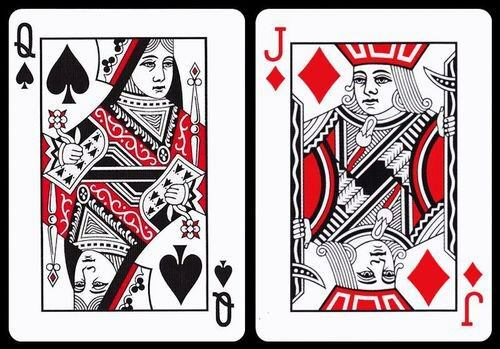 The Jokers are custom (we'll get to those in a moment), and the court cards have undergone some simple customization by giving them a simple red and black colour scheme. This adds to their striking impact, despite the familiar look. But you can take things to the next level once you realize that besides the optical illusion and animations of the card backs, the Mechanic Industries crew have also built in the potential for some more great magic courtesy of four special gaff cards. 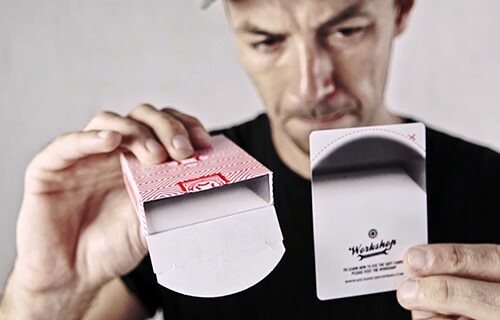 These extra cards allow you to perform some great and creative magic, especially with the help of the great tutorials available from Mechanic Industries. The first of the gaff cards is fairly standard: a versatile double-backer. The previous version of this deck had two Jokers that featured a coin-like back design, and could be used in conjunction with the blank faced card to create the illusion that the ink was being shaken off the Joker card, or that the coin design was being pulled off. This illusion worked best when performed with a matching Grinder Coin available from Mechanic Industries. The Red Edition of this deck improves on this concept by making the artwork of the coin on the card much more realistic. 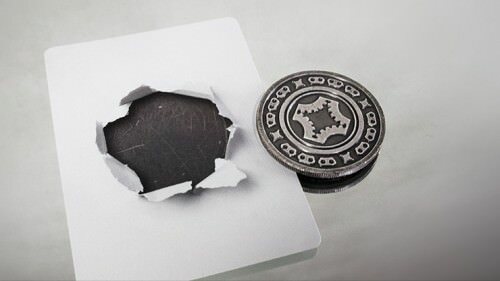 It's now a double-faced card, and while one side pictures the Grinder Coin, the other pictures a very realistic tear hole. This gives possibilities for creative routines which make it look as if the coin is being ripped right out of the card! This is perhaps the best gaff card of them all, and certainly will add a whole new dimension to your card magic. 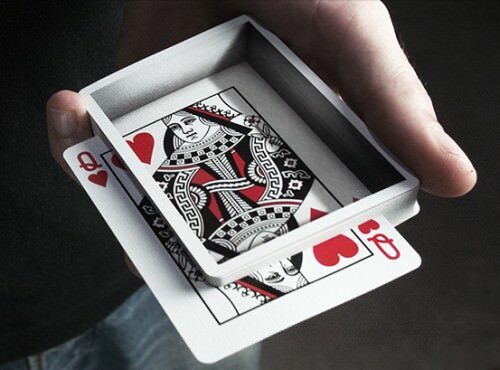 This gaff card pictures a Queen of Hearts, which can be used in conjunction with the regular Queen of Hearts from the deck, to create a most original optical illusion, that makes it look like the card is somehow being seen through the deck! Known as an anamorphic illusion, it relies on distorting or stretching an image to create an artificial sense of perspective. It really does bend the mind, and gives the potential for performing magic of a type that has never been seen before! The final gaff card requires some set-up, but once it is ready to go, it will make your card box look empty - even though it contains an entire deck. Angles and lighting are important in order to pull this off, but it is a very creative and convincing illusion when everything comes together perfectly. While not likely to be a headlining routine in and of iteself, this is something that can easily be used in conjunction with other effects, for that extra punch that really blows peoples minds. Given the unique nature of these gaff cards, you'll need some help getting started with these fun cards. Fortunately Mechanic Industries is providing us with everything we need, including full online instruction via detailed video tutorials. In fact, you don't even need a secret code to access these - you can go ahead and check these videos out right now for free. So you'll know exactly what you get, how it works, so that you can make an informed decision about whether this is a deck for you. Nice. I just ordered a deck of these. Can't wait to check out the Queen. Great - let us know what you think of it, and how it goes for you!